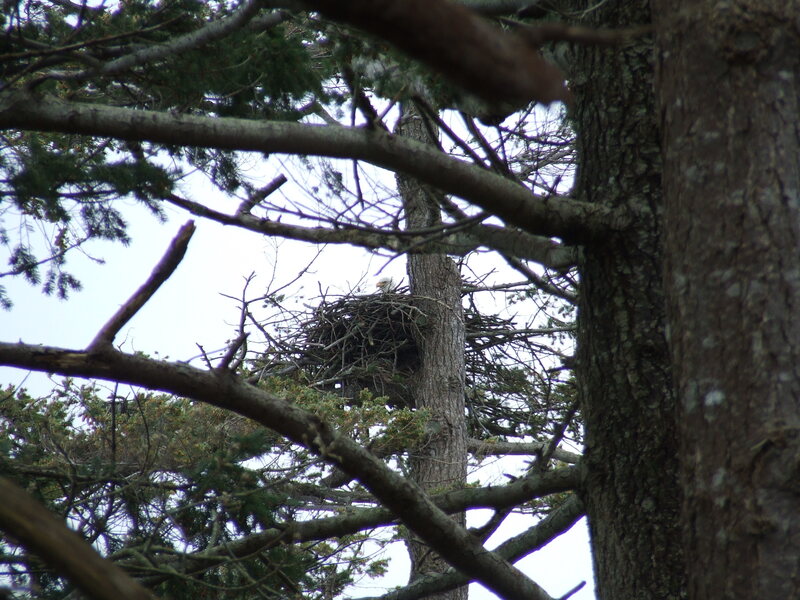 This is the thread for posting fotos, videos & discussion of the Dunlop nest. 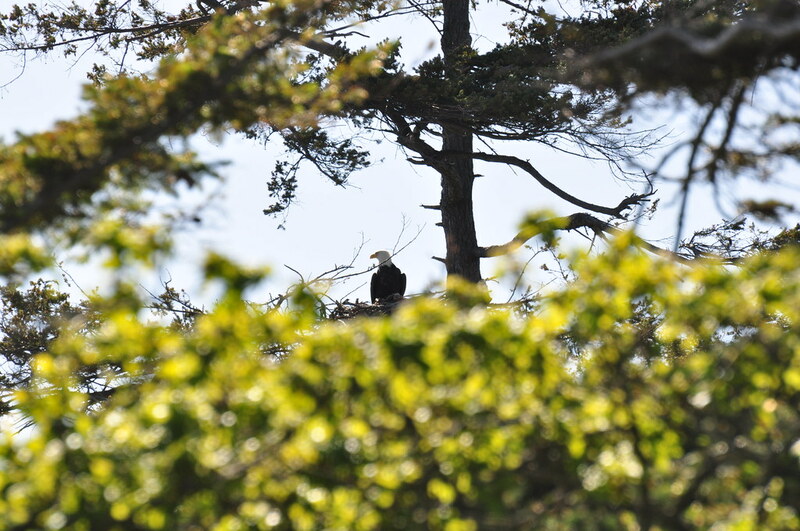 This nest is right on Dunlop Point, at the southern tip of Tribune Bay. i*d pick this nest for an eagle cam. 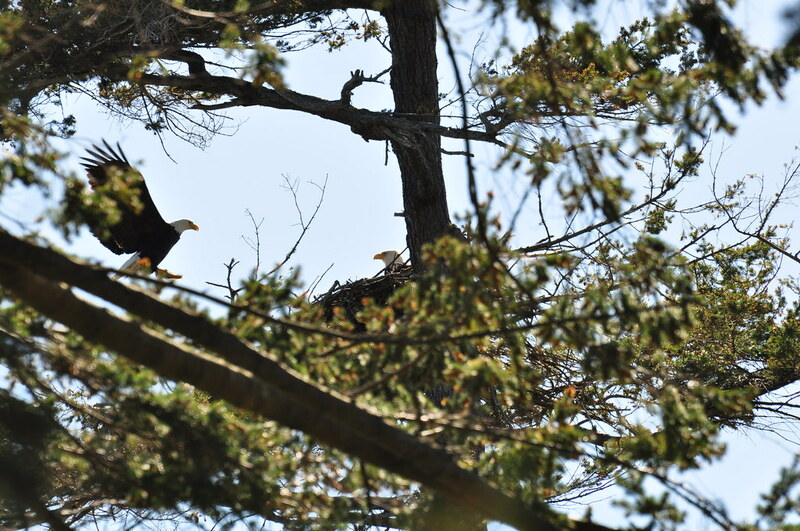 Last year, this nest had two eaglets. 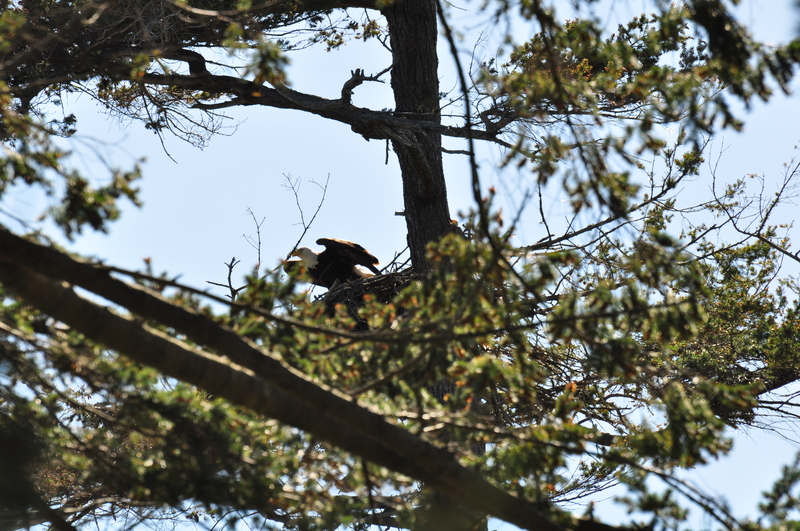 This is likely one of the eaglets that fledged from this nest last season. 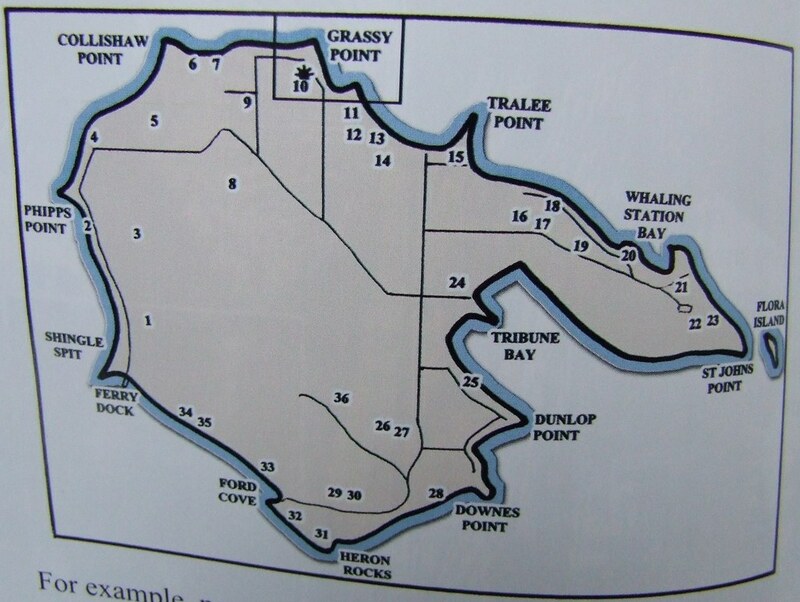 Sandpiper Beach is to the right of the Dunlop nest. 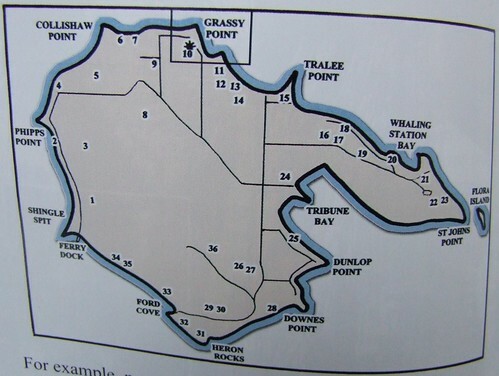 It is an excellent site for fishing. 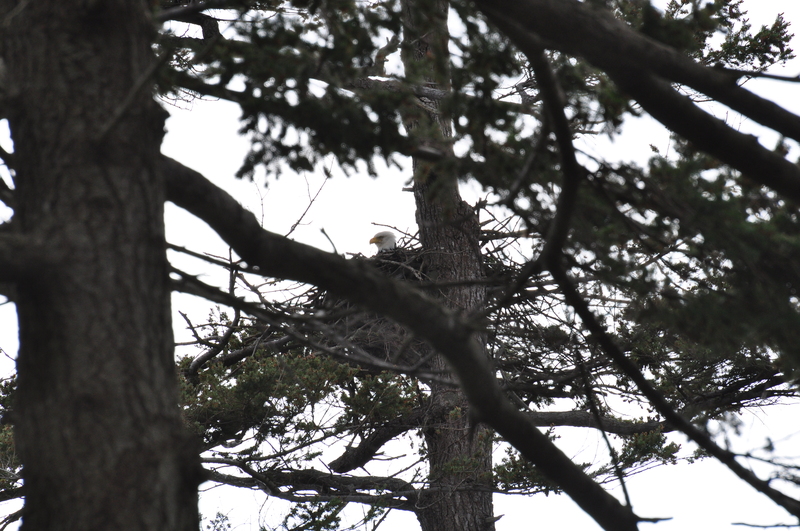 i get to peek at this nest once a week when i work nearby. Today i heard lots of eagle calls, & saw adults flying by & i think an immature or juvenile as well. 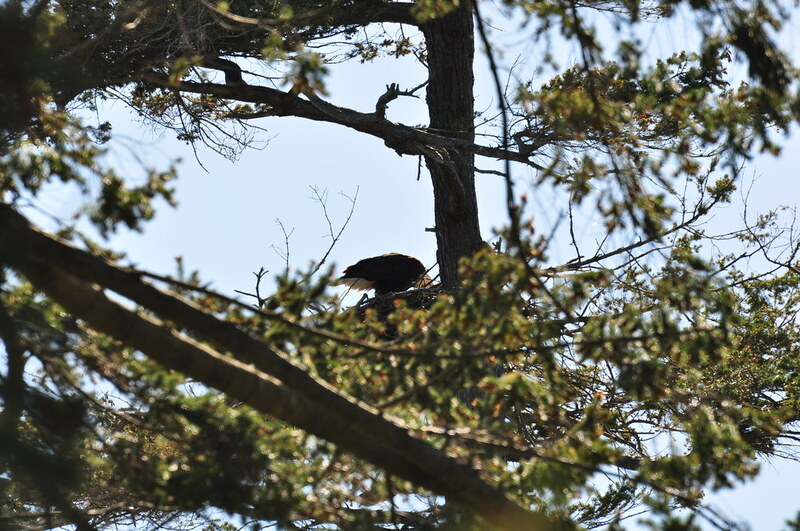 i could hear an adult calling from the area of the nest tree, but i couldn*t spot them. Finally i spied this adult right in the nest. 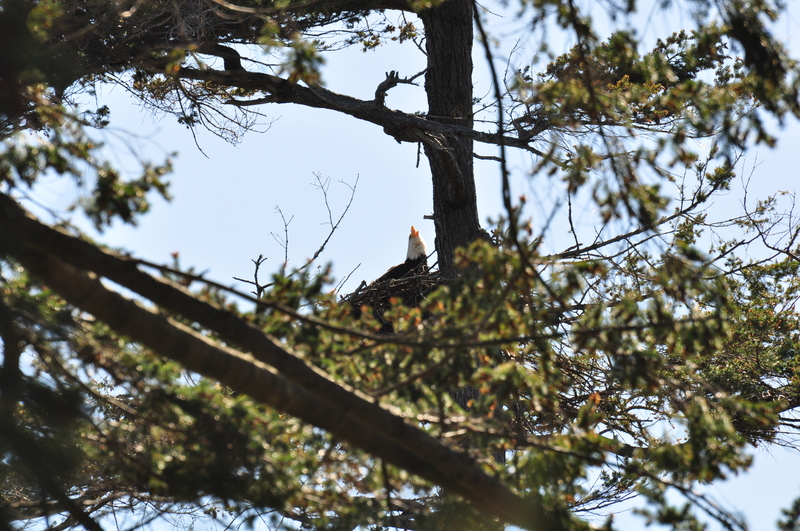 i took a number of fotos of them, & though their head swivelled back & forth, they did not move from this spot. So, i suspect they have at least one egg on this nest, & that this adult is incubating. One day i*ll bring my good camera & get some better fotos. 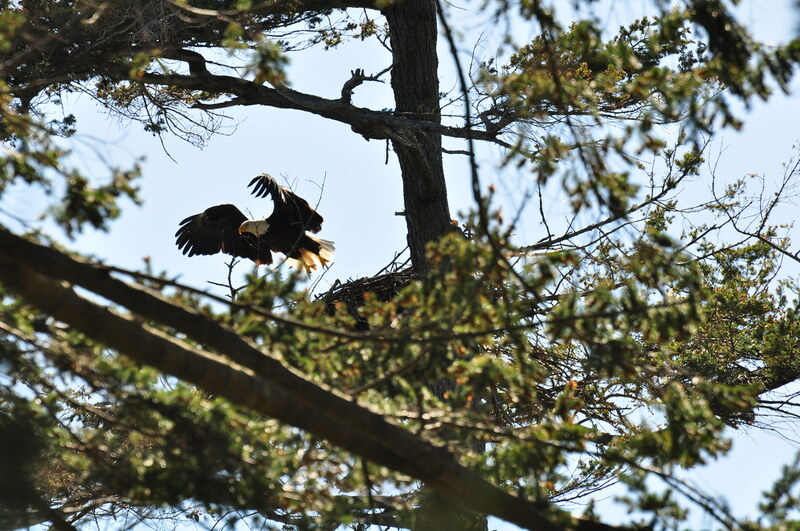 This nest had two healthy looking eaglets last season. i found this pellet two weeks ago under the perch trees for the Dunlop nest. Is it an eagle pellet? 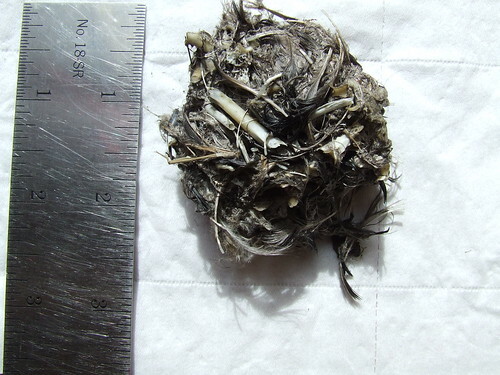 Is seems to be full of small bones & feathers, as of a small bird. i shall tease it apart carefully & then take more fotos. march 28 2010 - pellet - eagle? owl? i work near this nest once a week. i brought my camera with me this week! It still looks to me as though someone is sitting on eggs here! i am pretty much positive there is at least one hatchling here, watching the Mum & Dad*s behaviour! Booni, I have no idea how you animate your photos, but it is so delightful to watch! Thank you. It was a hot day & the nest was right in the sun. Mum Dunlop is cooling off here by panting. You can see her tongue! 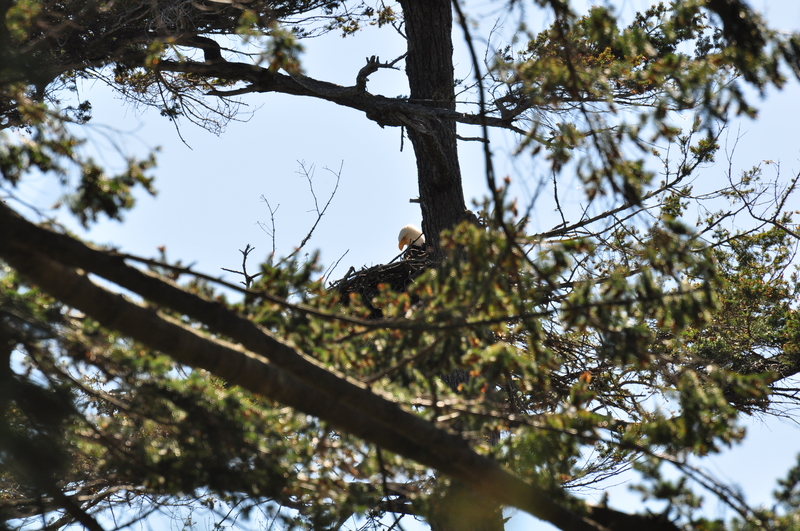 Here, the Mum is looking down, as though at the hatchling beneath her. Isn*t she a sweet looking Mum? & she strikes me as younger that the webcam Mum. i could see Mum watching something coming her way. & he brought a midshipman! This tells me there*s a hatchling. i LOVE the look on their faces, & how they*re looking at each other! 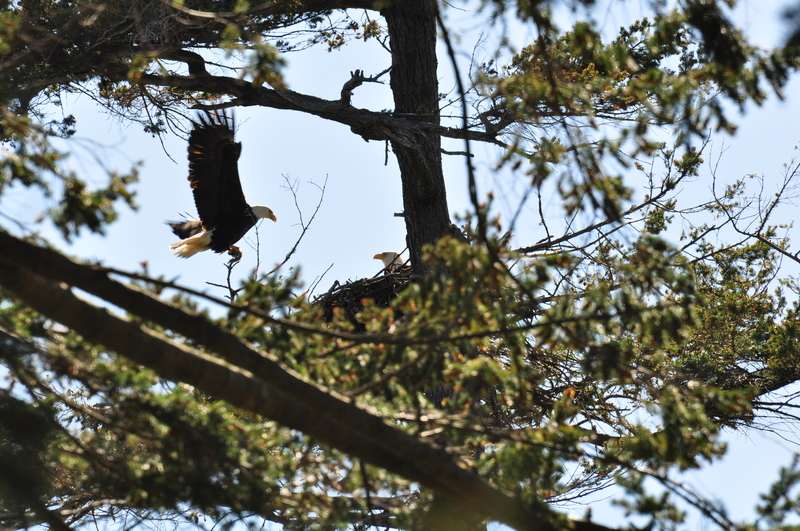 To me, these are a gorgeous pair of eagles! april 29 2010 15:52 - Is Mum Dunlop feeding a young one here? Awww! 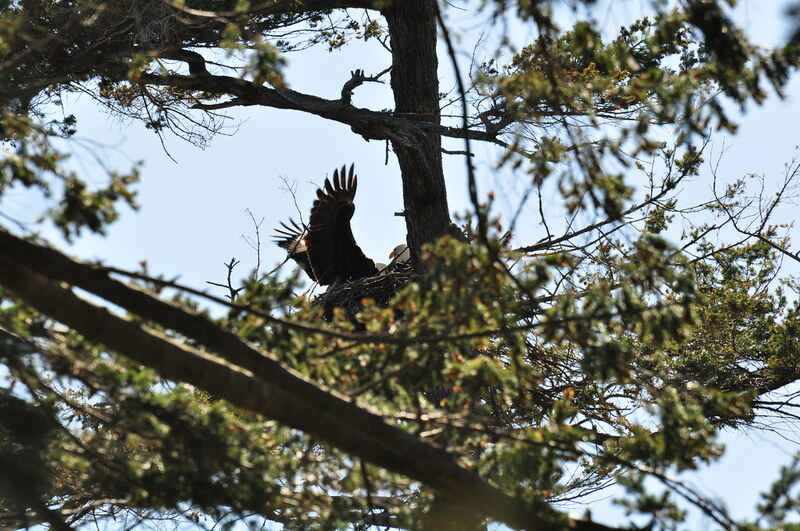 Another baby on Hornby...wonderful to see. I am looking forward to seeing if you spot another eaglet in the nest. Thanks for sharing. Booni, I love the picture! 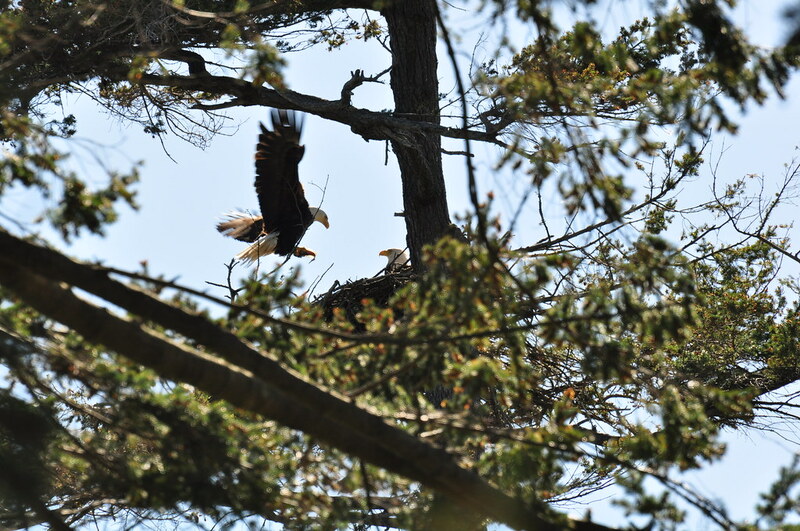 Everybody, make sure you click the picture and then click again at flickr and you can see the baby peeking out below the adult. 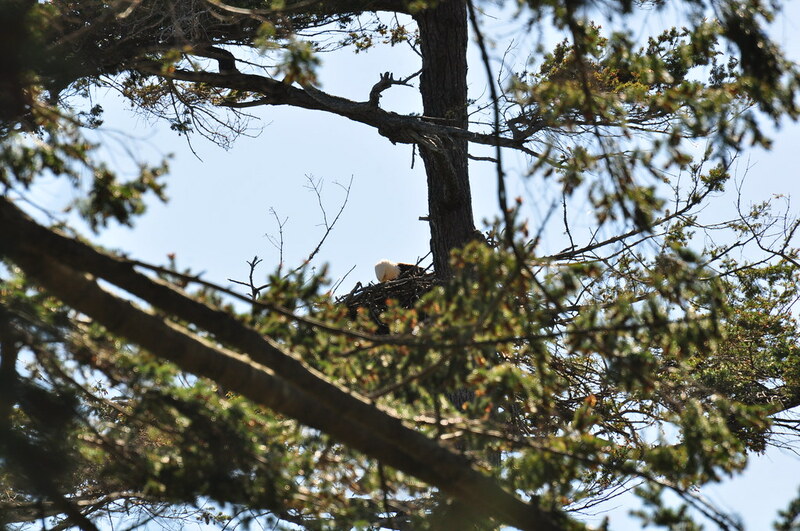 Bonni, this eaglet looks like it still has the "big eye" look. Do you know if he is a bit younger than Phoenix? 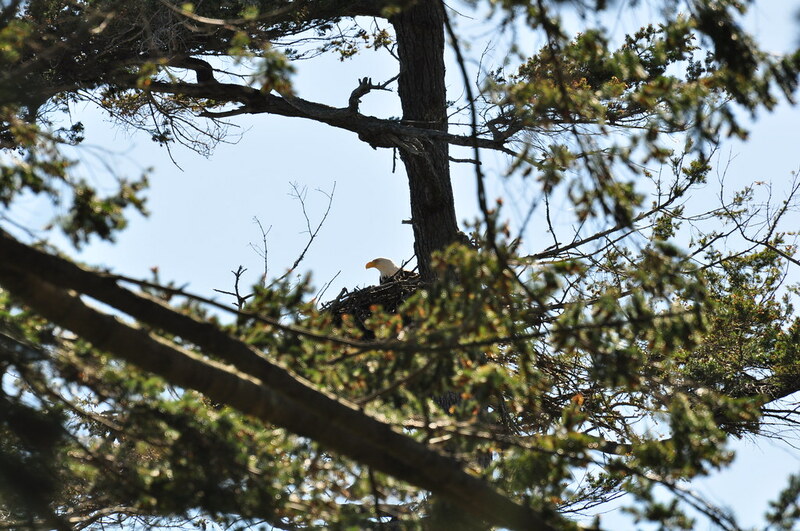 birdvoyer, i*m pretty positive there is only one eaglet on this nest. i watched for quite a while, & just this one was visible the whole time. Though, i suppose one could*ve been lying around while the other was moving around. i think i saw feeding, though, & only one eaglet then. luv, i think this eaglet is the same age as Phoenix. At first i thought this one was younger too, but i watched them stomp around the nest, just like Phoenix does, so i think they are of a very similar age.